Keto Meatloaf Recipe - "Tender & Juicy" - Easy To Make Just Bake! 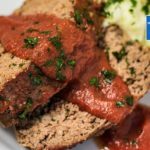 Our Keto Meatloaf Recipe is homemade with lots of readily available ingredients. This meatloaf will turn out "Tender, Tasty & Juicy" and of course very Low-Carb! Preheat your oven to 160C/320F and prepare a loaf tin by lining with baking paper. Place a non-stick frying pan over high heat and saute the onion and garlic in the tallow, until the onion is turning translucent. Set aside to cool slightly. In a large mixing bowl add the warm onion mixture and all remaining ingredients, except the extra marinara sauce. Using clean hands, or wearing disposable gloves, mix the ingredients very well. Press into the base of your prepared loaf tin, ensuring there are no air bubbles, and smooth the top. Drain off some of the juices and top the meatloaf with the extra marinara sauce. Leave to sit for 10 minutes to rest, before slicing and serving.